There are several methods to communicate with the server module during the initial installation. Plan which method you will use. Before you perform the installation, arrange to have the equipment, information, and permissions required by that method. Note - For information about identifying and configuring IP and MAC addresses, refer to the configuring network addresses information in the Server Module Administration Guide. 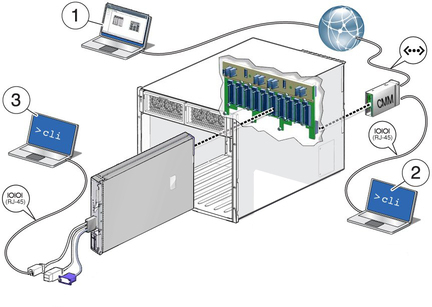 Choose one of the connection methods to communicate with the server module SP. The connection methods are shown in the figure and described in the table. Obtain the cables, monitoring devices, addresses, and passwords required for the method you choose. The CMM NET MGT port must be connected to your network. You must know the IP addresses of the CMM. From your network, you must be able to log in to Oracle ILOM on the CMM using the IP address of the CMM. Then you can use the Oracle ILOM proxy to navigate to the server module SP Oracle ILOM interface. See Method 1a – Power On the Host Through the CMM (Web Interface) and Method 1b – Power On the Host Through the CMM (CLI). A terminal device connected to the CMM SER MGT RJ-45 port. From this connection, you can use Oracle ILOM to navigate to the server module SP Oracle ILOM CLI interface. See Method 2 – Power On the Host Through the CMM SER MGT Port (CLI). A UCP-3 dongle cable that connects directly to the server module and a terminal device connected to the RJ-45 connector on the dongle cable. See Method 3 – Power On the Host Through the Front Panel (SP CLI).